Mortal Kombat X continues to roll out downloadable content via the Kombat Pass, which grants players early access to four upcoming fighters, skin packs and classic fatalities. Thus far, Netherrealm Studios has released horror icons Jason Voorhees and Predator, as well as classic kombatant Tanya. And now, the release of the last of the promised fighters is finally upon us. Tremor has arrived. Now, Tremor doesn’t come alone as he’s packaged with Klassic Skin Pack 2, which features alternate costumes for Jax, Kung Lao and Quan Chi. Tremor is billed as a classic Kombatant, which has left some fans scratching their heads as not much is really known about the origin of Tremor. One thing that is certain in the world of Mortal Kombat however, is that Tremor is a force to be reckoned with who will no doubt deliver large amounts of blood, gore and pain. Check out the official Tremor release trailer below. So just who is this mysterious brown-clad ninja known as Tremor? 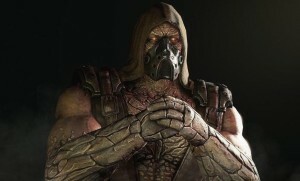 Well first of all, Tremor is a member of the Black Dragon clan and a disciple of Kano. Tremor first appeared in Mortal Kombat: Special Forces, which was released back in 2000 and was met with ill-fated reviews. Tremor was a boss in that game, but not many fans know this because the game bombed out so badly. MKX marks the first time this “Klassic character” is completely playable, according to a press release from Warner Bros. Tremor also made an appearance in the Playstation Vita version of the last Mortal Kombat game from 2011 as a usable character during a challenge tower mission. Check out the video below for a complete history of Tremor in the Mortal Kombat series. Now, Tremor and the Klassic Skins Pack 2 are the last components of the Mortal Kombat X Kombat Pack via DLC. So, are fans led to believe that this is the last we’ll see as far as DLC for MKX? Well, according to game developer NetherRealm Studios, who hosted a livestream showcasing the three variations for Tremor which include Metallic, Aftershock and Crystalline, more DLC could in fact be on the way. At the end of the livestream, the developer called Tremor the “end of Kombat Pack 1″. That quote sent shockwaves throughout the Mortal Kombat universe as fans now have hope that more characters could be arriving via a second Kombat Pack. Furthermore, back in April MK creator Ed Boon teased his loyal followers by stating that a new “Story Pack” may be on the way. Personally, I think it would be great if Warner Bros. packaged together a new story mode along with a possible Kombat Pack 2. It would certainly make the game developers more money and just add on to the already monster sales they have achieved. One thing is for sure, if any new Mortal Kombat news hits the wire be sure to check back right here on morbidlyamusing.com.